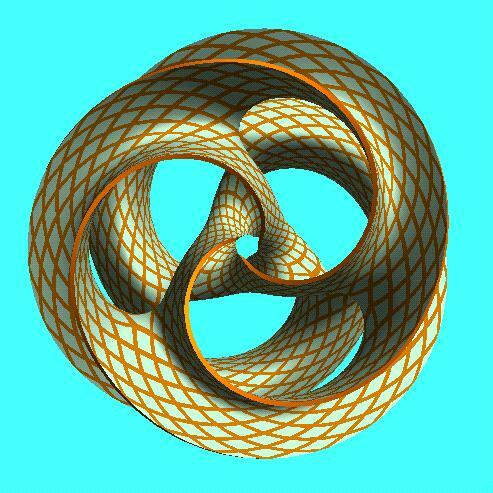 These parts will serve as a geometrical model in classes on modeling and math of minimal surfaces, and as a small scale model for artists, e.g., Brent Collins, who is doing similar sculptures in wood. 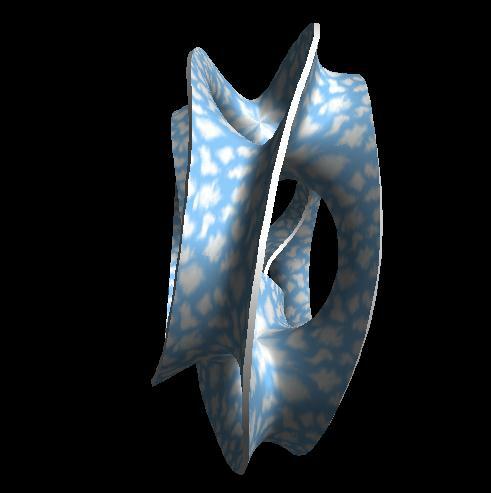 This is a new version of the 3-fold symmetrical version of a 3-storey monkey-saddle Scherk tower bent into a toroid. 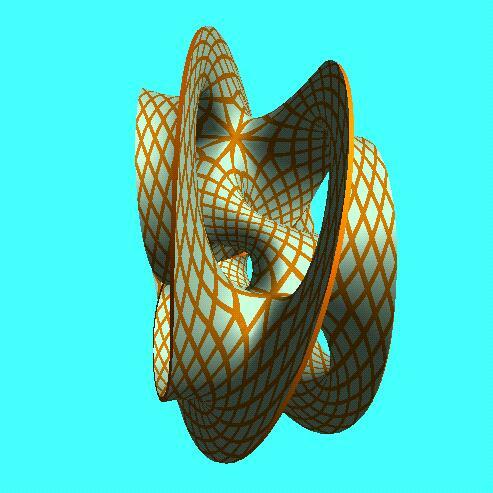 This is a 5-storey monkey-saddle Scherk tower bent into a toroid. 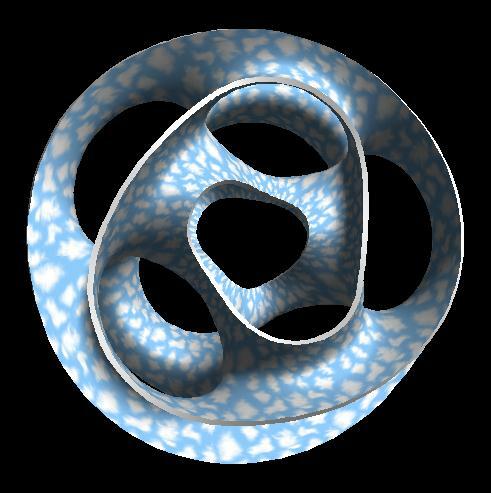 This is a really nifty new structure: It is a double toroidal loop in which the first and second passage are intertwinde with one another - without intersections ! It is formed from a 9-storey Scherk tower with 4th order saddles. WARP = 720 degrees ! The scale or strength of this model is not critical; it can be scaled so as to fit optimally a particular process or some remaining space in a run of a larger piece. Ideally we would like a part scaled to be 3-5 inches in diameter. Orientation is not critical either. 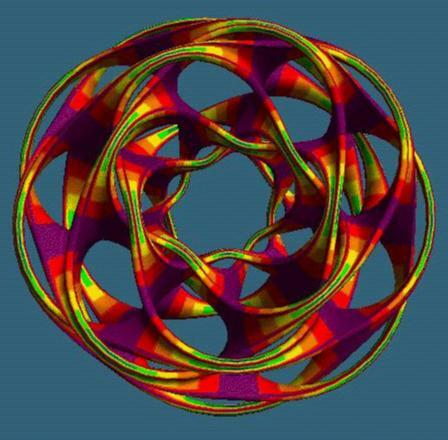 However, for a layered manufacturing process (SLA, SLS, etc), it might be best to turn the object 90 degrees around the x-axis, thereby giving the part minimal height, and preserving its radial symmetry ideally. The more complicated parts, in particular the "Woven Quad" should probably be built with SLS or with some other technology where the support structure can be easily removed. In these .STL files have not been merged (yet); so they need software that does not get upset when shared vertices appear separated by one unit in the last digit due to rounding errors.